Well, Merry Christmas to ME! This Mickey Mouse Castle Pendant is full of so much shininess and joy that it belongs under my tree RIGHT this second! Rebecca Hook is a jam-up designer, and this little piece of Rose Gold Happiness is just one of the reasons why we’re her BIGGEST FANS! You can find our other Favorite Disney Accessories right here and check out our Favorite Mickey Mouse Necklaces here! 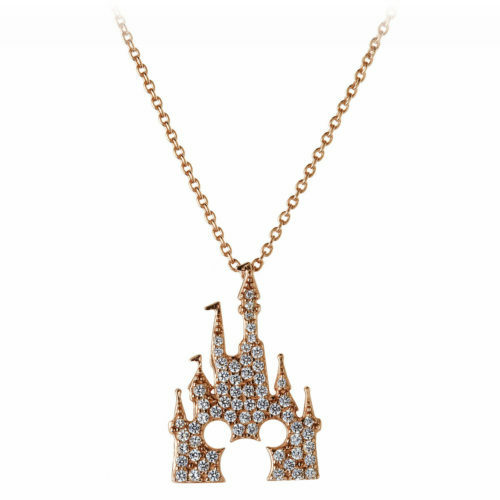 This is just the prettiest little castle pendant. I don’t know why but reminds me so much of that photograph of Walt walking through Sleeping Beauty castle on a misty morning. I love that picture and I love this necklace.